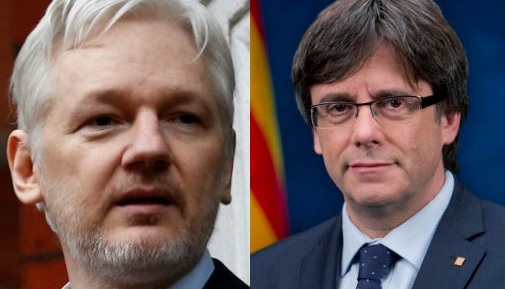 Two Freedom Fighters and Political Prisoners: Assange and Puigdemont. This tweet caused anger not only in Spain but also in Ecuador. The foreign ministry demanded that Assange deletes the tweet, which he refused. Shortly after, the Ecuadorian diplomatic mission cut Assange’s communication with the outside world and prohibited visitors from seeing him. Since 2012, Assange sought refuge in the embassy, escaping extradition to the US where he expected charges of espionage because of having released so-called secret documents about the crimes committed by the US occupation forces in Iraq and of releasing tons of emails showing how criminal the US government behaves. Initially, the whole ‚Assange affair‘ started with sexual allegations against him, which he apparently committed in Sweden. These trump-up charges were brought up by a Swedish prosecutor month after pressure from the Obama administration, which sought revenge because of WikiLeaks releasing unclassified US material about its wrongdoing. Years later, the Swedish prosecutor dropped the charges. Germany should not extradite Puigdemont to Spain because he is a democratically elected President of the Republic of Catalonia and has done nothing wrong. In Spain, he will not get a fair trial because other members of his former government are sitting in jail without trial. The right-wing Rajoy government applies an article from the Fascist Franco era. The charges against Puigdemont include, among other things, rebellion, abstraction of funds. We have to wait and see whether the German courts are still independent. It could be that they will succumb to pressure by the Merkel government who supports the absurd claims of the Spanish government. In Rajoy’s Spain, Puigdemont and his colleagues wouldn’t get a fair trial. Dieser Beitrag wurde unter Internationale Politik abgelegt am März 30, 2018 von Ludwig Watzal.